My kids don’t play hockey or lacrosse, or for that matter don’t play any organized sport that involves a locker room. So I must admit I’m behind the times when it comes to the phenomenon known as locker boxing. Locker boxing — or helmet boxing, as the Wikipedia entry is listed — involves athletes donning their sports’ gloves and helmets for a round of fisticuffs in the locker room. Well, that definition seems obvious, doesn’t it? You try to hit your opponent in the head repeatedly until he’s knocked down, gives up, or has his helmet knocked off. 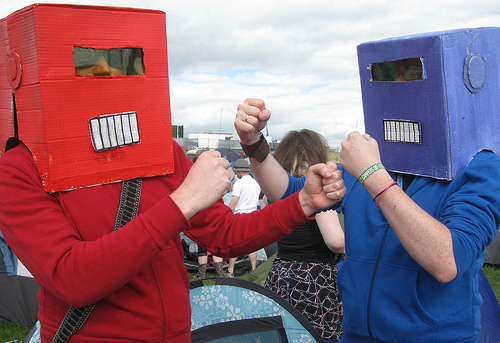 It combines two classics: the stupidity of teenagers, and Rock ‘Em Sock ‘Em Robots. Locker boxing, a common nonhockey and nonlacrosse cause of concussions among hockey and lacrosse players, got back into the news recently thanks to the lacrosse team at Gowanda High School outside Buffalo. WKBW-TV breathlessly reported that it obtained videos of Gowanda lacrossers (or whatever they’re called) engaged in some locker boxing — as if you couldn’t do a search for “locker boxing” and YouTube and come up with a zillion videos. This one was added a mere hour before I typed this. Whomever posted this made it clear who was fighting by, you know, posting names. Yup, girls do it, too. Unlike, apparently, the videos I posted above, locker boxing actually ended up causing some trouble in Gowanda. Originally the superintendent canceled the lacrosse team’s season after getting wind of the videos, dated April 29. Then under pressure from parents of the 15 team members not present in the video, the school board reversed that decision and suspended only the five players fighting and/or making videos of the fights for the rest of the season. The coach, however, is out for the rest of the year, according to WKBW, so he won’t be at the team’s final game May 25. Locker Boxing [sic] was banned by the Greater Toronto Hockey League almost three years ago, but recent news reports suggest that it may be making a comeback in locker rooms across Canada and the U.S. – sometimes with coaches watching from the locker room sidelines. School officials said [Coach Roy] Logan was not present during the April 29 incident. Despite the ban, there is still locker boxing in the Greater Toronto Hockey League, and there are still coaches watching it from the locker room sidelines. As bad things that can happen in a locker room go, I guess there are things that are worse. Still, what the hell, teenagers? Forget your health and general welfare. Don’t you know how much your parents paid for that equipment? Christ! You might wonder, with all the shenanigans happening in school sports locker rooms, how come there isn’t more supervision? I’ll give you two words: USA Swimming. The problem with, say, assigning a coach to hang out in a locker room while strapping teens undress and shower together is the line of perverts that would form to volunteer for the supervisory job. I’m not sure whether a coach needs to walk in every few minutes (not regularly — you don’t want the kids to know your patterns) to make sure things are good. Honestly, I’m not sure what you could do, other than what Gowanda did — suspend players and coaches. You don’t need to install video cameras to track locker boxing. Go to YouTube, and you’ll see the kids have that covered.